Prvi Partizan 270 Winchester Ammo 150 Grain Soft Point ammo for sale online at cheap discount prices with free shipping available on bulk 270 Winchester ammunition only at our online store TargetSportsUSA.com. Target Sports USA carries the entire line of Prvi Partizan ammunition for sale online with free shipping on bulk ammo including this Prvi Partizan 270 Winchester Ammo 150 Grain Soft Point. Prvi Partizan 270 Winchester Ammo 150 Grain Soft Point ammo review offers the following information; Prvi Partizan 270 Winchester is a new production ammo that features 150 Grain Soft Point bullets. Soft point bullets feature a soft lead exposed nose that generate controlled expansion and a uniform mushroom. 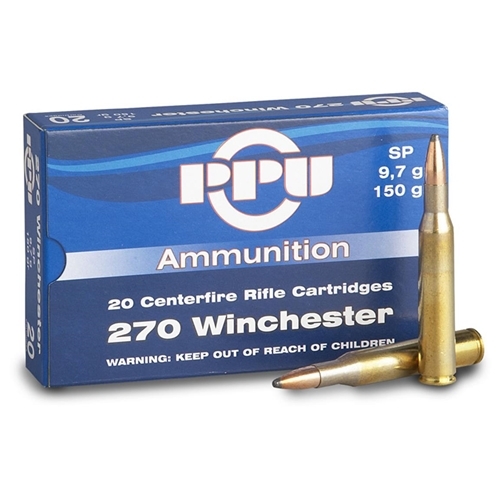 This 270 Winchester by Prvi Partizan ammo is non corrosive, reloadable, feature brass casing, and feature Boxer primers. With a muzzle velocity of 2837 feet per second and muzzle energy of 2677 feet pounds making the 270 Winchester by Prvi Partizan ammo ideal to use as hunting ammunition. Prvi Partizan 270 Winchester ammo is packaged in boxes of 20 rounds and cases of 500 rounds (containing 25 boxes of 20 rounds each). Soft point bullets feature a soft lead exposed nose that generate controlled expansion and a uniform mushroom. With a muzzle velocity of 2837 feet per second and muzzle energy of 2677 feet pounds making the 270 Winchester by Prvi Partizan ammo ideal to use as hunting ammunition. Prvi Partizan ammo meets SAAMI standards and is managed by an internal quality system to make sure there is 100% customer satisfaction. Prvi Partizan 270 Winchester Ammo is a little smokey but great. The shipping was fast and the box was plain and super strong. I couldn't have packed it better myself. I only fired off 200 rounds so far but haven't had any misfires or jams. Highly recommend. Great Pricing. Didn't try. It was out of stock.